Kristine & I will be giving a 7 Summits slideshow presentation this coming Tuesday night, September 2 @ 6pm, at the Edwards campus of CMC (Colorado Mountain College). So, if you don’t have much going on that evening or need a break from whatever it is you are doing, come on out and join us. 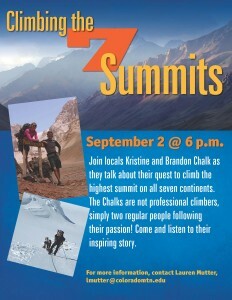 We’ll probably talk about the 7 Summits quest for an hour or so leaving plenty of time for questions. Apparently, the presentation will take place in the Lecture Hall, Room 118. This is a free event and open to the public. Should be a fun evening!